Microsoft has issues with it’s cloud services since two weeks. 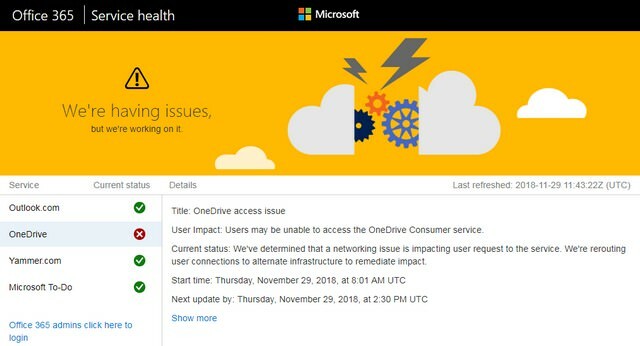 We have had at least two outages for Azure/Office365.com during this period. And now it seems, that the next wave of issues occurs. Tom Warren has asked within the Tweet below, whether OneDrive users are especting issues. Is OneDrive down for you? Currently, 29% of people report problems, while 71% don’t notice anything. So it seems to be a worldwide effect. However, I can access my OneDrive myself – but other German bloggers are reporting access issues. Visiting the status page https://portal.office.com/servicestatus for Office/Azure, it reports issues with OneDrive – the page says that users cannot access the end user version of this service (so OneDrive for Business is not affected). Tero Alhonen also reported an outage of Azure Data Lake Store. according to his Tweet below. It probably concerns the service that is disturbed in Northern Europe, as you can see in the tweet above and on this status page. Microsoft writes that the whole thing is currently under investigation. Any of you affected? This entry was posted in Cloud and tagged Cloud, issues, OneDrive. Bookmark the permalink.